Who would you like to hear from at a Third Tuesday social media meetup? What topic would you like to hear discussed? One of the great things about Third Tuesday is that we can program the speakers and topics to respond to the interests of you – the Third Tuesday community. So, I’m asking for your suggestions of the speakers and topics that you are most interested in and that you think other members of the Third Tuesday community would also be interested in. Have you seen someone speak at a conference who absolutely blew you away? Have you read a book that gave you new insights into social media, community, search and the future of our online life? Is there a blogger who is writing great content that should be shared with others? Is there a company, organization or person who is using social media in a creative and cutting edge way? Your suggestions will guide the programming for the winter sessions of Third Tuesday. So, please have your say and let me know who you think we should invite. And thanks to our sponsors – CNW Group, Molson Coors Canada, Rogers Communications, Radian 6 and Fairmont Hotels and Resorts – we’re able to bring these speakers not just to Toronto, but also to the other Third Tuesday cities across Canada. Already this year, we’ve brought Shel Israel to Vancouver, Calgary, Montreal, Ottawa and Toronto. And just last week, we were able to bring Katie Paine to Ottawa. So, who would you like to hear from and what would you like to discuss at Third Tuesday. Please offer your suggestion as a comment below or a tweet to @thornley. Windows 7 Review. There's a lot to like. If you follow me on Twitter, then you know that I endured a serious case of #VistaFail. Microsoft Windows Vista began to install a service pack on my notebook – and then it crashed. And it kept crashing. Ultimately, I was forced to reinstall the operating system, losing data in the process. (This happened while I was on the road and unable to back up my data.) Then, the ultimate insult. The morning after I got my computer up and running, as I was shutting it down to leave my hotel room, I received another unasked-for message that Windows was installing updates. Not just one update, but 32 updates. And, as always, the helpful onscreen message warned me not to shut down my machine. So, now I’ve been living with Windows 7 for several days. And I’d like to share what I think of it. Wow. I love the new Task Bar. The Windows 7 version of the Task Bar allows me to pin to it the programs that I use most frequently. And instead of individual icons for each open document, I see only the program icons. 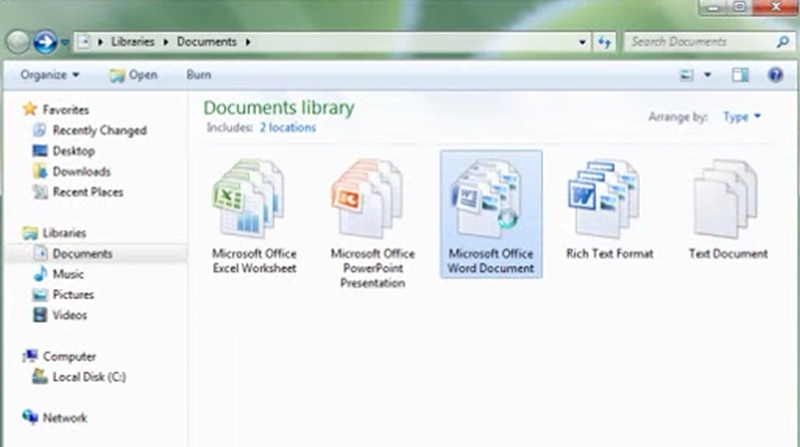 If I want to see individual documents, I only have to hover my cursor over the program icon in the taskbar. A popup window appears above the icon showing miniature versions of each open document. Hover over a miniature version and it appears full size on your display. Click on it and it opens for editing. With the new Windows 7 Taskbar, all my favourite programs and open documents are right there where I can see them. Windows 7 is fast. Much faster than Vista. This shows up when I boot up. But it is much more dramatic when I open programs like iTunes. With Vista, it could take as much as a minute when I plugged my iPhone into my PC before iTunes opened. With Vista, it now takes less than 5 seconds. Goodbye time wasted waiting for tasks to complete. Finding files and programs. Windows 7 search function is vastly improved over earlier versions of Windows. Want to change opening folders and files to single click from double click, but you can’t find the right place to do this in Control Panel? Simply search the term “single click” in the Start button search and you’ll be provided with a link directly to the Folder Options screen in which you can make this change. Even better, Windows 7 makes it much more simple to find files spread across folders on your hard disk and on external hard drives. They’ve added “libraries”‘ of your documents, music, pictures and videos. What’s the difference between a library and a folder? A library will display documents, pictures, music or vidoes that you have saved anywhere on your computer. Want to add the contents of an external hard disk to be displayed in your libraries? You can easily add a folder to a library from a drop down menu in the folder. Find your files easily regardless of where you stored them. Home Networking is made easy with Windows 7. A new feature, HomeGroup, enables any user to set up a home network to share folders, files and printers with other users. A very nice, overdue feature. Once I’d installed Windows 7, it turned out that Windows 7 drivers are not yet available for each of my Dell computers. The Dell download site offered Windows 7 drivers for my enterprise-class Latitude E 6400. However, it did not yet have Windows 7 downloads for my Vostro 400 desktop. Given that the Vostro line is targeted at small businesses that don’t have dedicated IT departments, that was disappointing. Hopefully, Dell soon will offer drivers for the entire Vostro line. Home networking. My home computer is on my office domain. And Windows 7 won’t allow me to set up a home network with other users in my family. Instead, I’ll have to ask my son or daughter to so that I can access files and printers remotely. If Windows Vista is your current operating system, run, don’t walk, to your nearest store and get a copy of Windows 7. If you’re still using Windows XP, I think that you’ll find the user experience of Windows 7 more than justifies the upgrade. Getting Started for tips on how to use the new Taskbar, the “jumplists” of recently or frequently opened files, and how to easily arranged windows to take all or half of your display space. 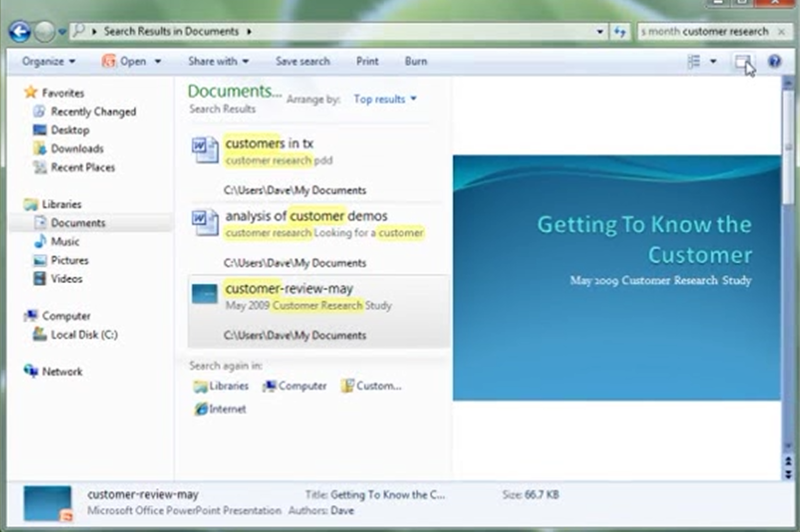 Find your files for tips on how to use Libraries and Search to quickly find files and programs. Sharing files with HomeGroup to see how easy it is to set up a home network and share files and printers. What’s your experience with Windows 7? Are you using Windows 7? What’s your experience with it? Are there features you’re finding useful? Are you encountering problems? Share your experience by leaving a comment. This morning, the CCPRF brought togetherin Toronto a group of top level corporate communications executives to discuss best practices in communications measurement. The discussion was led off by a panel of measurement experts: David Alston from Radian6, David Scholz from Leger Marketing, Jacqueline Taggart from Watson Wyatt and Alan Chumley from the CPRS Measurement Committee. What follows is the highlights of the Twitter coverage (hashtag #CCPRF) of the discussion that I captured using CoverItLive. Enjoy. 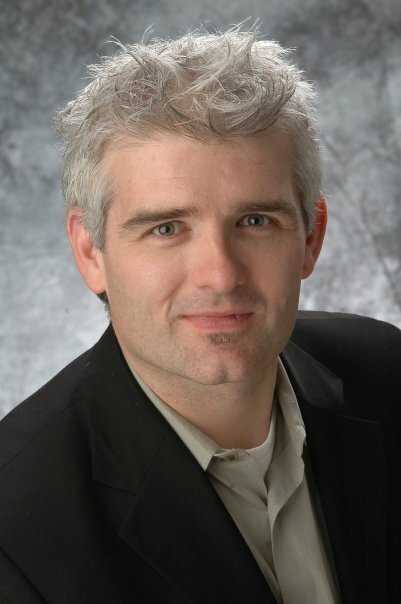 At the most recent Third Tuesday Toronto, MeshMarketing organizer Mark Evans donated a ticket for us to give away to one of the attendees. We decided to offer it to the person who gave us the best tweet about why they wanted the ticket. So, we took him up on his offer. Now, David has followed through and passed the ticket along to Andrea Tavchar, a Professor in the PR program at Humber College. Where do you look for advice when you are considering whether to buy a product or service? If you’re like me, you’ll probably search for customer reviews on specialty Websites or, event better, you’ll reach out to your online friends to find out who has experience with the product or service and what they think of it. Customer reviews married to social media are changing the way that many people make decisions. At the next Third Tuesday Toronto, four well-known entrepreneurs will share what they have learned building and working with customer reviews and social media. We’ll hear from Ali De Bold, co-founder, ChickAdvisor Inc., Pema Hegan, co-founder, GigPark.com, Brian Sharwood, president, HomeStars.com, and Stuart MacDonald, CEO and founder, Tripharbour.ca and Tripharbor.com. Special thanks go to Eden Spodek, founder of Bargainista.ca, who suggested this session and put the panel together. 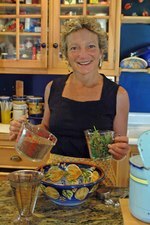 Eden also will moderate the discussion. You can register online to attend Third Tuesday Toronto. I hope to see you there. 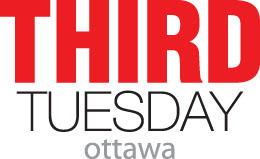 One more thing: As always, we’re grateful for the ongoing support of our Third Tuesday sponsors: CNW Group, Molson Coors Canada, Rogers Communications, Radian6, and Fairmont Hotels and Resorts. Their support is allowing us to program great speakers not just in Toronto, but at Third Tuesday across Canada. Jay Moonah closed the Managing Social Media conference with a presentation focusing on how non-profits and government organizations can make effective use of social media. The greatest hurdles I’ve encountered to the use of social media in the enterprise have been legal and security concerns. Kevin Lo and Stewart Wolfe covered the IT security issues in their session at the Managing Social Media conference. Copyright. The Elephant in the Room? I’ve long grown accustomed to the principles behind Creative Commons copyright. Sharing is encouraged within boundaries defined by the creator. However, traditional “rights restricted” copyright law still governs most of the world. Pina D’Agostino, Director of the Intellectual Property Law and Technology Program at the Osgoode Law School, provided an overview at the Managing Social Media conferenceof the key copyright issues for social media applications and the need for guidelines and policies to ensure that intellectual property rights are respected.